Looking for a quick, elegant spring dessert? This fresh blackberry tart pulls together easily, thanks to ready-made puff pastry that is very user-friendly. For us non-bakers of the world, puff pastry, found in the frozen dessert section of your grocery store, is a godsend and can be the starting point of so many fabulous desserts. Watch your pastry as it cooks, as the cooking time varies from oven to oven. Mine was done in 16 minutes! I used blackberries here, but strawberries, raspberries or blueberries would be equally delicious. If your knife skills are decent, think about experimenting with thinly sliced peaches or plums, once summer fruit comes into season. While the pastry bakes, you prepare a simple cream spread. 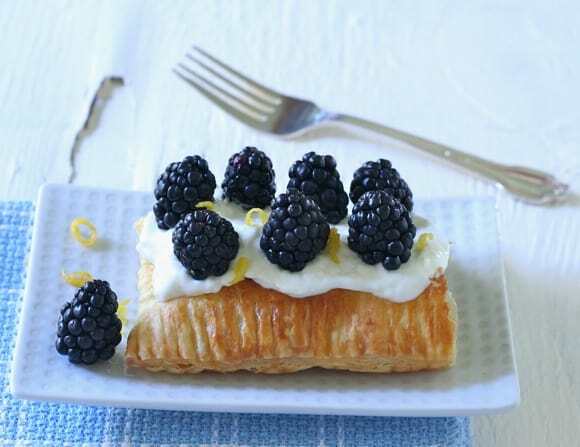 Once the pastry cools, all you do is gently spread the cream onto the cooked pastry crust, dot with berries and serve. TIP: Trim the edges of the pastry, just slightly, before baking to insure even rising of the dough. Assemble this dessert just before serving, to avoid biting into pastry that might become soggy if the tart sits too long. A fresh blackberry tart, made easily by using defrosted puff pastry and a simple, creamy spread. Trim the edges of the defrosted pastry and place on buttered parchment paper lining a sheet pan. Turn the pastry over so that the creases don't split while baking it. Brush pastry lightly with the beaten egg. Make a ¾ inch border around the dough by pressing a fork to make parallel lines in the dough. Prick inside the border with a fork and sprinkle 1 tablespoon of sugar on top. Bake in the lower half of the oven for about 20 minutes, until the pastry is puffed and golden. Cool on a rack while you make the creamy spread. Whisk together the sour cream, whipped cream cheese, remaining 3 tablespoons of sugar, vanilla and lemon zest. Once the pastry has fully cooled, spread the cream over the pastry, keeping the edges neat and clean. Dot with berries. Garnish and serve at once. I love how easy this is, but how elegant and delicious. This is my kind of dessert. I am not much of a baker. Thanks, Elizabeth -I’m having fun with the recipe, thinking of different variations. This is the PERFECT spring and summer dessert. So easy, and so delicious!! And what a beautiful photo, Liz!! I almost bought blackberries at the store today. Now I wish I did. Great photo and recipe, Liz. Wow, what an easy yet delicious idea! Great photo! I love berry tarts, yours looks so delicious! Thanks for the recipe! Almost too pretty to eat…….almost. Oh, Liz! This is beautiful! And I totally agree about puff pastry. Always have some in the freezer waiting for me! Liz – this is a beautiful dessert! I love using fresh berries with pastry. I’m on the lookout for a gluten-free puff pastry so I can make this. I wish I knew where to send you for the gluten-free puff pastry. Great – it is impressive – just assemble shortly before serving – you can bake the pastry in advance – watch carefully in your good oven – it cooks fast.